Am 1. Advent fand der Merler Weihnachtsmarkt gegenüber dem Merler Dom statt. Viele Stände mit den unterschiedlichsten Angeboten luden zum Rundgang ein. 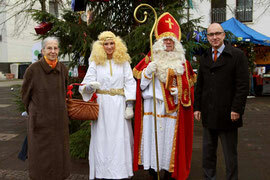 Eine große Anzahl an Besuchenr fanden den Weg zum Markt - darunter auch der Nikolaus mit seinem Engel und eine Märchenerzählerin. Vom Weihnachtsmarkt und dem Baumschmücken am Vortage, gibt es hier eine ausführliche Fotogalerie - siehe Bereich "Events - Merler Weihnachtsmarkt und Baumschmücken. It is the best time to make some plans for the future and it's time to be happy. I've read this post and if I could I wish to suggest you some interesting things or advice. Maybe you could write next articles referring to this article. I desire to read more things about it! Heya i am for the first time here. I found this board and I to find It really helpful & it helped me out a lot. I am hoping to give one thing back and aid others such as you helped me. Pretty component to content. I just stumbled upon your site and in accession capital to say that I acquire in fact loved account your blog posts. Any way I'll be subscribing for your feeds and even I fulfillment you access constantly rapidly. Right here is the perfect web site for anybody who wants to understand this topic. You know so much its almost hard to argue with you (not that I actually would want to�HaHa). You certainly put a fresh spin on a subject which has been discussed for years. Excellent stuff, just great!